While fruit is a key part of a healthy, balanced diet, there can be “too much of a good thing”. On the positive side, fruits offer lots of nutritional benefits, such as vitamins, antioxidants, and fiber. 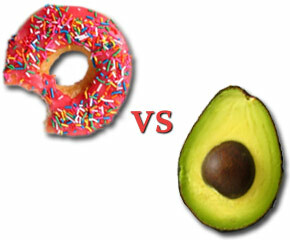 Fruits are also a great way to satisfy your sweet tooth without turning to candy, cakes, or any other processed foods. However, fruit tends to be high in sugar, and just because it’s fruit sugar doesn’t mean it’s wise to eat unlimited amounts. The body still treats excess fruit sugar like any other kind of sugar, putting it right into fat storage! Excess sugar in your diet will certainly cause you to gain weight, as well as increase your risk for type 2 diabetes and many other diseases and disorders. Don’t avoid fruit for fear of sugar; be smart about fruit and eat the right fruits in moderation. Keep reading to discover three easy tips for demystifying the fruit nutrition issue. Sad but true, some high-sugar fruit favorites include grapes and bananas. A one-cup serving of grapes has 23g of sugar, and a one-cup serving of banana contains 18g. Oranges come in right under bananas, with 17g of sugar per one-cup serving. If you go to town on these fruits, you’ll have maxed yourself out on sugar before you know it! Drying fruit removes all the fluid, which means you will want to eat more of it to feel full. The bad news is that all the sugar is still present even when the fluid is gone. Consider that a one-cup serving of raw, fresh apricots contains 14g of sugar, while a one-cup serving of dried apricots contains a whopping 69g of sugar! And that’s the kind with no sugar added. Many commercially-available dried fruits have added sugar on top of that! Don’t avoid your favorite fruits; just eat them in moderation. Have half a banana on your cereal instead of a whole one. Treat yourself to a small handful of dried apricots, or chop some up and sprinkle them on your yogurt or your salad. If you have a sweet tooth, feel free to reach for fruit instead of ice cream or other processed sweets. Your sweet tooth will likely be satisfied, and you’ll have done yourself the favor of giving your body essential nutrients and fiber instead of empty calories. Also, the fiber content of fruit slows the rate of digestion, unlike processed sweets, which digest quickly and leave you hungry again soon after. You’ll find that the more you replace processed sweets with fruits, the less you will crave the processed nasties in the first place. It might be hard at first, but you’ll get used to it! When snacking on fruit, consider cutting back the fruit content and mixing in other healthy snacks like raw, unsalted nuts or other protein sources so that you’re not snacking on fruit alone. 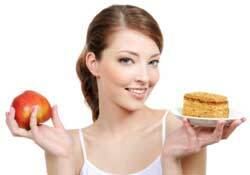 Try half an apple with a hardboiled egg, or maybe a cup of strawberries with a handful of raw almonds or walnuts. 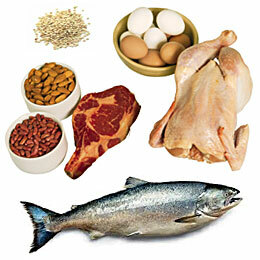 The protein will help you feel full for longer. 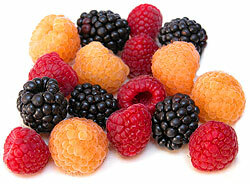 Fruit Nutrition Tip #3: Choose Berries! Berries offer lots of variety, are low in sugar, high in nutrients, and taste delicious! Physiological benefits of different types of berries are numerous; everything from improving cognitive function to increasing the metabolism of fat to the prevention of cancer and cardiovascular disease. Eat your way through the rainbow of fresh berries and your body will thank you. As for sugar content, raspberries have the least sugar of any of the berries, only about 5g per one-cup serving. Great news for me, as raspberries are a personal favorite! Strawberries have about 8g of sugar per one-cup serving; not too bad at all. Blackberries and cranberries are also fairly low in sugar. You might be wondering where apples fall in all of this, given the age-old “apple a day” recommendation. A medium-size apple has about 17g of sugar and 85 calories. Not too bad overall, and apples also offer lots of healthy fiber; 5g in that medium apple we’re talking about. If you like apples, go for that apple a day. More than one apple daily is not recommended. If you like to snack on apples all day long, cut it into pieces and eat on the same one throughout the day. I hope this article has given you some food for thought about fruit nutrition. Try not to stress too much about the sugar content of fruit. 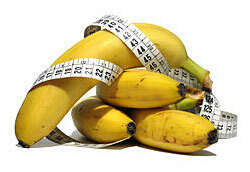 If you’re desperately craving a banana, eat a banana! 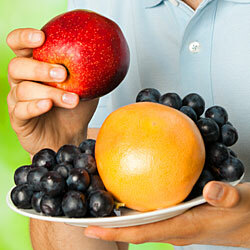 Eating fruit is certainly a lot more beneficial to the body than reaching for other types of sweet treats out there. Eat fresh, raw fruit as part of your balanced nutritional plan. As with anything good, moderation is key!